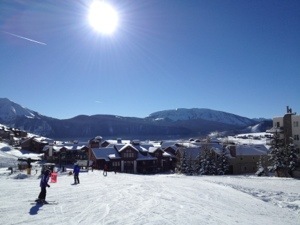 It is beautiful here in Crested Butte and warm when the sun shines. Out of the sun and at night it is very, very cold. The cold made for a pretty difficult first morning whilst we got all the ski equipment sorted out. The Big One, who doesn’t have much meat on her, was totally miserable until we got her some toe warmers for her boots! 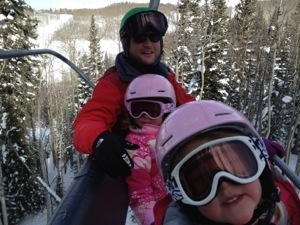 We put the girls into ski school for the first time yesterday and they loved it. We popped in to see them at snack time and lunchtime, then caught up with them to go up the mountain together with their teacher. They ski so well after only 11 hours of skiing lessons. And they ski so fast that when we took them out skiing today I had to ski properly to keep up. No snowplough turns (or pizza as the girls call it!) for them. The Big One flew over some moguls today and my Lovely Husband struggled to keep up with her. She’s been jumping off hills and trying to ski in the powder too! Snow is forecast for the next couple of days so we may not get out again this trip. Even with all the right gear on (and the toe warmers!) the Big One is miserably cold the instant the sun disappears. We may ski on Christmas Day though – apparently is nice and quiet (not that it’s that busy now anyway – no waits for the lifts here). And for the girls, as long as it is sunny, nothing will make them happier.